Karan Bass heads the 55-member strong Congressional Black Caucus. House Republican leaders voted to strip Iowa Republican Steve King of all his committee seats, just hours after the Congressional Black Caucus had asked for such action. “They must actually condemn Mr. King by removing him from his committee assignments so that he can no longer affect policies that impact the very people he has made it clear he disdains. Republicans should make clear Mr. King is no longer welcomed in their party or Congress. 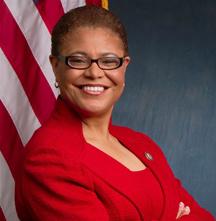 Anything less than these substantive actions is another tacit acceptance of racism from the Republican Party,” said Karen Bass, the new chair of the 55 member strong Congressional Black Caucus before Republican leaders announced their action. The California congressperson’s request came after King asked the New York Times when the terms "white supremacist" and "white nationalist" become offensive. Even after endorsing Faith Goldy, a White nationalist who has associated with anti-Semitic and neo-Nazi websites, for mayor of Toronto, and speaking with a far-right Austrian publication, King won reelection in his Iowa district. “Like Donald Trump, Steve King has sought again and again to give comfort to White supremacists, something that should never be allowed in the halls of Congress or the Oval Office,” Bass also said in a statement. King’s district is 96 percent White and, technically, about 50 percent rural, and includes the college town of Ames. It’s near the larger cities of Des Moines, Iowa and Omaha, Nebraska. King’s last salvo prompted Sen. Tim Scott, the only Black Republican Senator, to write an op-ed explaining why King and his language do not represent the GOP or conservatism. Scott declines to participate in the Congressional Black Caucus. Troubles for King have not ended. At press time, Democrats and some Republicans are seeking further actions.